On August 14, when Jet Airways (India) Ltd announced its earnings for the April-June quarter, its 65-year-old chairman Naresh Goyal’s cheerful demeanour was a far cry from the sombre mood prevalent in the Jet Airways camp less than two years ago. Goyal, along with James Hogan, president and CEO of Etihad Airways PJSC, Jet’s equity partner, and Cramer Ball, Jet’s CEO, were all smiles and even held hands as they posed for the shutterbugs. The reason behind their apparent delight was the impressive profitability and growth in revenues posted by India’s second largest private carrier for the quarter ended June 30. Jet reported a net profit of Rs 221.70 crore in the April-June 2015 quarter, against a loss of Rs 217.60 crore in the same period a year ago. Its net sales rose by 11.55 percent to Rs 4,834.50 crore, against the same quarter last year. Jet’s earnings for the first quarter of fiscal 2016 beat Street estimates by a significant margin—a poll of analysts by Bloomberg had actually expected Jet to post a loss. The improvement in Jet’s operational and financial performance is reflected in the company’s stock price as well. Over the last one year (as of August 24, 2015), the Jet Airways stock has gained around 31.27 percent on the BSE, while the bourse’s benchmark Sensex lost 2.39 percent. What is particularly reassuring for Goyal, the rest of the senior management at Jet, and the airline’s foreign partner is that the profit reported by the company in the June quarter isn’t a one-off. Jet has reported profit after tax (PAT) in three of the last four quarters: Rs 70 crore in the September 2014 quarter and Rs 63.11 crore in the December 2014 quarter, apart from the June 2015 quarter. The company slipped into the red in the March 2015 quarter, posting a loss of Rs 1,729 crore, but that was due to a clean-up of the balance sheet undertaken by recognising an impairment charge on account of its investment in its subsidiary JetLite. But results are already showing and this shift in fortune comes after a period of huge uncertainty for the airline. India is one of the more complicated aviation markets in the world and high taxes, expensive jet fuel, and a price war among airlines looking to capture greater market share threatened the sustainability of even the most established carriers three years ago. With mounting losses, airlines found themselves saddled with a debt burden they felt unable to service. Jet’s story was no different. The airline, one of the first private sector carriers to come up in India (it commenced operations in 1993), was forced to delay its debt servicing obligations and salaries to staff owing to financial trouble. Different airlines tried to deal with the turbulence in different ways. With a tight control on costs and efficient operations, India’s largest airline by market share, IndiGo, managed to thrive in the face of adversity and has been consistently reporting healthy profits. On the other hand, unable to raise fresh equity, Kingfisher Airlines, the premium carrier promoted by flamboyant liquor baron Vijay Mallya, has been grounded since December 2012 and its assets have been seized by lenders who are still trying to recover their dues. India’s national carrier Air India is struggling but has managed to remain afloat, largely due to a government-funded turnaround plan. Unable to keep bankrolling a debt-laden, no-frills carrier’s constant need for funds, SpiceJet’s promoter, billionaire Kalanithi Maran, sold the company back to one of its original co-founders Ajay Singh. __Jet emerged as the only entity among incumbents (only Vistara, which started operations recently, has Singapore Airlines as a strategic partner) that brought in a foreign strategic partner in the form of Abu Dhabi-based Etihad, which invested Rs 2,058 crore for a 24 percent stake in the airline in November 2013. Not only did the deal offer Jet Airways’s balance sheet a much-needed shot of capital, the Mumbai-based carrier has benefitted from Etihad’s expertise in running global aviation operations—its own as well as in collaboration with partner airlines worldwide. Etihad also presents Jet with more passengers—those from its global operations that land at one of India’s major international airports and seek to travel onwards to other domestic destinations. Apart from that, it has helped extend Jet’s international reach considerably through codeshare arrangements within the Etihad group. Shared services, including maintenance of aircraft, has also led to optimisation and rationalisation of costs. The Jet-Etihad partnership has completed its first full financial year of operations (2014-15) and the press conference on August 14 was meant to showcase its report card, which was an encouraging one. Goyal commenced the briefing with a speech that highlighted the benefits that Etihad and his “good friend James’s (Hogan)” presence had brought to Jet (Hogan was also appointed Jet’s vice chairman at the company’s annual general meeting held earlier on the same day). He outlined some of the operational and financials improvements at Jet while Hogan and Ball made elaborate presentations on the same theme. The common message that ran across the three executives’ addresses was that Jet was on course to return to profitability by 2017 as a part of the three-year turnaround plan being implemented at the airline since 2015. Jet’s earnings have exhibited a sustained recovery. It first reported a net profit for the September 2014 quarter, its first profitable three-month period after six consecutive loss-making quarters. For FY15 as a whole, Jet’s losses halved to Rs 2,101 crore compared to the previous year. According to Ball’s presentation made on August 14, Jet generated cash of Rs 441 crore from operations in FY15 and has been current in servicing its debt obligations since September 2014. Jet still has a significant amount of debt on its books but its ability to service may have improved. As on March 31, 2015, Jet had a debt of around Rs 11,900 crore. The carrier has been able to refinance a lot of this debt (around 76 percent) through foreign borrowings that has brought down the interest cost on such loans. The impact of falling crude prices cannot be underestimated: Fuel costs typically account for around half of an airline’s overall operating expenses. For the June quarter, Jet’s aircraft fuel expense fell by 20 percent to Rs 1,444.69 crore. But an industry insider familiar with the turnaround plan being implemented at Jet told Forbes India that while around 60 percent of the improvement in the company’s bottomline was due to lower jet fuel costs, an encouraging sign was that the remaining recovery was on account of new measures for operational efficiency bearing fruit. As part of his presentation, Hogan stated that Etihad had invested $750 million in “the future of both airlines”, without giving a break-up of this investment. The synergies, however, are already showing. The partnership with Etihad has given Jet increased connectivity and business from passengers who travel between Abu Dhabi (the United Arab Emirates has a significant Indian migrant population) and India. “By the end of 2015, we (Jet and Etihad) will offer 42,000 seats each way each week (between Abu Dhabi and India),” Hogan said. This would be more than double the number of seats on offer in May last year. The two carriers have also restructured their schedules on routes in which both the airlines are operational to provide better departure schedules and connectivity and reduce so-called ‘wingtip flying’, which refers to parallel flights by both operators on the same route. As a part of this exercise, the excess flights have been redeployed and that has led to overall operational efficiencies for the entire Jet-Etihad network, Hogan said. Codesharing arrangements, which is an agreement between two or more carriers to share the same flight, between Jet and Etihad, as well as Etihad’s other global partners, including Air Seychelles, Alitalia, Air Berlin and Air Serbia, have also helped increase Jet’s reach and the number of passengers it carries. “We have carried 1.4 million guests on account of codeshare partners (Jet has 21 such partnerships in place at present), which is 85 percent more than our previous year (FY2014) codeshare carriage,” Goyal said. These initiatives appear to have had a positive impact on Jet’s passenger load factor (PLF), a key measure of an airline’s capacity utilisation, which rose 2.1 percentage points year-on-year to stand at 82.5 percent for the quarter ended June 30. In FY15, Jet flew 22.5 million passengers, 9.6 percent more than the year before. Going forward, analysts expect Jet to be one of the biggest beneficiaries of a rebound in air traffic in India, especially for outbound travel. The International Air Transport Association or IATA predicts that by 2031, India would be the third largest aviation market in the world, overtaking the UK. It is the ninth largest market in the world at present with the total air passenger market standing at around 101 million passengers. According to data from the Directorate General of Civil Aviation in India, passenger traffic for air travel grew by 21 percent between January and July 2015. This was due to lower fuel prices, improving economic climate, growing competition and several bouts of flash sales by airlines, says KPMG’s Dubey. Even Jet’s employees seem to believe in the carrier’s turnaround prospects, with seven senior executives who had quit the airline returning to the company. In Hogan’s own words, the first-year report card for the Jet-Etihad partnership looks good. “Aviation is tough business but the partnership is achieving traction. 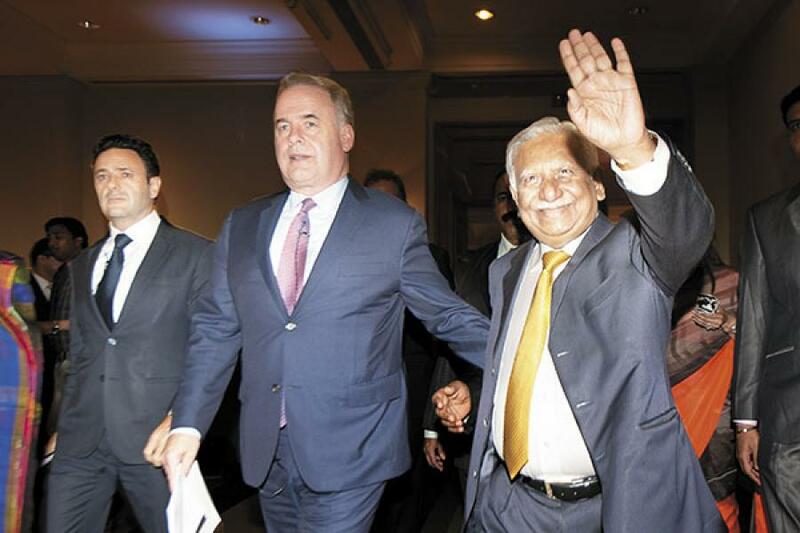 Together, we will now figure out how to market India as an inbound destination,” Hogan said. Hogan also took the opportunity to silence critics who have speculated that Goyal may be playing second fiddle to Etihad since the latter came on board. Is the FII influence on equities waning?